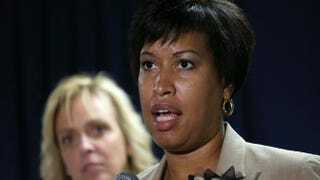 Washington, D.C., Mayor Muriel Bowser told lawmakers and city residents Friday that the District deserves representation in Congress, and she called for a citywide vote in November on the issue, reports the Washington Post. “I propose we take another bold step toward democracy in the District of Columbia,” Bowser said at a breakfast meeting in the nation’s capital celebrating the 154th anniversary of President Abraham Lincoln’s emancipation of slaves. “It’s going to require that we send a bold message to the Congress and the rest of the country, that we demand not only a vote in the House of Representatives. We demand two senators—the full rights of citizenship in this great nation,” she added. Currently, D.C. is represented by Del. Eleanor Holmes Norton in Congress, but she does not get a vote on the House floor. D.C. also does not have the authority to approve local city spending. The District’s budget is subject to congressional approval and must be signed into law by the president. However, the Post reports that for the first time ever, Bowser and the D.C. Council plan to enact a local spending plan—totaling $13 billion—without congressional appropriation of those funds. Instead, the city will begin spending its money unless federal lawmakers act to stop it. There has been a “DC Statehood” movement for some time, and the crux of it is the notion of “taxation without representation,” which appears on District license plates. Last summer, presidential candidate Sen. Bernie Sanders joined statehood calls for the District and was one of 16 co-sponsors of the New Columbia Admission Act, saying it is “morally wrong” to block District residents from federal representation. Norton introduced similar legislation in the House earlier in the year. As it now stands, a Republican-controlled Congress has no interest in granting D.C. statehood. The politics of it are that the District has always leaned heavily Democratic, and GOP loyalists feel that two D.C. Senate seats could tip the balance of power in the Senate. But Bowser is adamant that this is not about politics.